Even though, we don’t think of our Pizza as fast food, it’s true that our Pizzas being made to order in our Marana Forni oven are ready in a short amount of time… You could qualify it as fast food. In this article, Michele Parente relates us the test that Maurice Di Marino, Wine director for Cohn Restaurant group, brought for wine pairing for casual food. 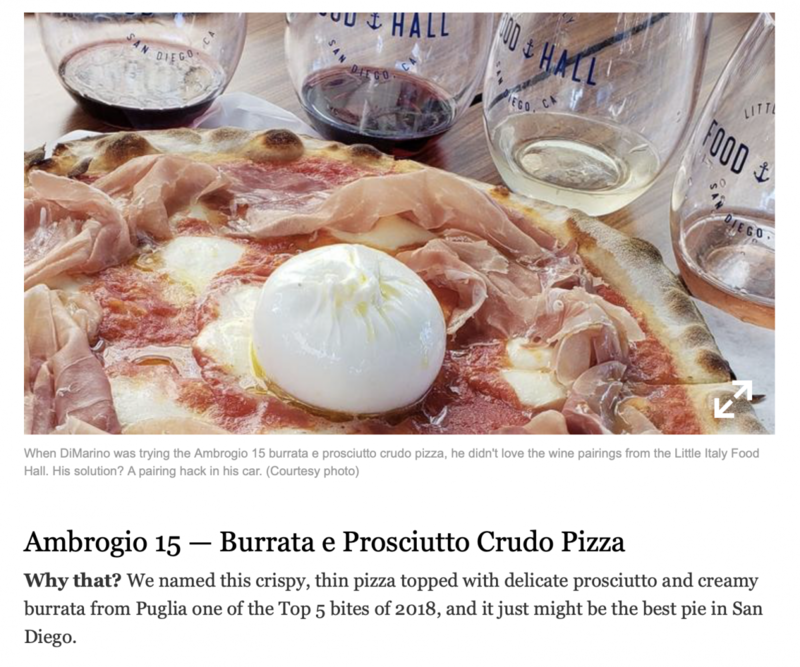 “We named this crispy, thin pizza topped with delicate prosciutto and creamy burrata from Puglia one of the Top 5 bites of 2018, and it just might be the best pie in San Diego.” says the journalist who has our pizza at the #1 spot of her rankings. If this is something you feel like doing, we recommend that you use our online take out stores, that will get you to skip the line and be able to grab your pizza fresh out of the oven twenty minutes later. This Take Out option is available from our Pacific Beach and Little Italy locations. We suggest that you checkout the sparkling selection of DOCG Imports, they are our wine partner, including for the Barolo Wine Dinner on January 29th 2018.